It won't take too long after you arrive at Woodhouse Chrysler Jeep Dodge RAM to realize that the Dodge Journey is built to perform. 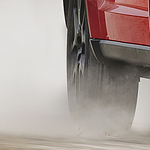 When driving a Journey equipped with the 3.6L Pentastar V6 engine, you will be able to tow up to 2500 pounds. This provides a bit of flexibility in how you use your vehicle. To make things easier when towing something, the Dodge Journey comes equipped with Standard Trailer Sway Control. This system works in conjunction with the Electronic Stability Control to apply the brakes and make adjustments to engine throttle in a manner that reduces sway.